Tuesday is the annual Hangeul Day that commemorates the creation of the Korean alphabet in the 15th century, with events scheduled throughout the country. Hangeul, which can be translated into “writings of Koreans,” was created by King Sejong of Joseon in 1443 and was promulgated three years later. As the king himself wrote upon the promulgation, it was created to help commoners read and write. Up until that point, the Korean language existed without a writing system and people had to use Chinese characters. The actual Hangeul Day traces its origin to 1926, when the forerunners of today’s Hangul Association celebrated the first Gagya Day -- referring to the first two characters in Hangeul -- on Sept. 29 of the lunar calendar. After a few changes in date and a name change to Hangeul Day in 1928, it was designated as Oct. 9 in 1945, the year Korea was freed from Japanese colonization. 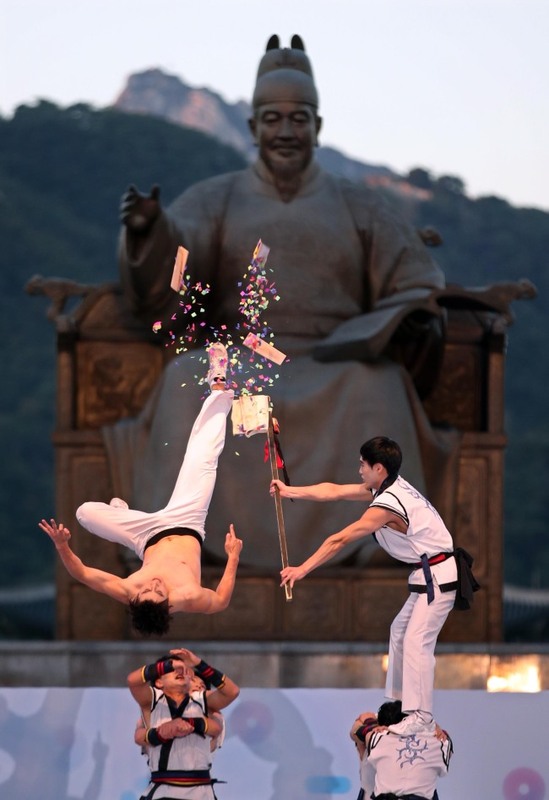 To mark the 572 years since the writing system was presented to the public -- which also falls on the 600th anniversary of Sejong’s coronation, the government will hold an official ceremony in front of the king’s statue in Gwanghwamun Plaza in Jongno-gu, central Seoul, at 10 a.m. Tuesday. Hangeul Day was designated as a national holiday in 2006. Highlights from the musical “Oesol” -- a story about linguist and independence fighter Choi Hyeon-bae and his efforts to spread and protect the writing system during the colonial era – will be performed at the ceremony. Sejongno Park, just across the street from the square, will be a stage for seven children’s plays. 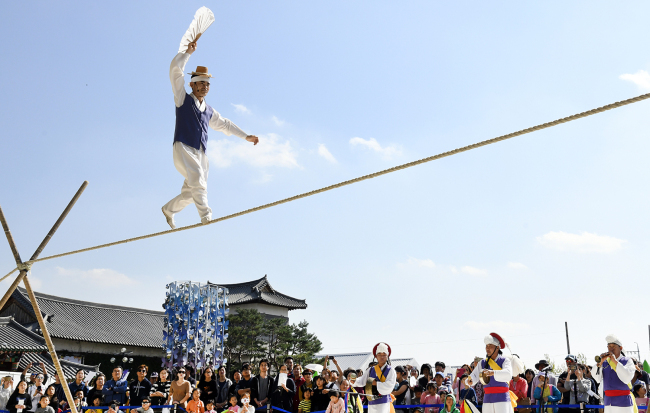 The Hangeul Festival, hosted by the Ministry of Culture, Sports and Tourism, is being held on Monday and Tuesday throughout Seoul under the theme of “Hangeul Embraces the World.” This includes 40 groups’ performances and exhibitions in Ganghwamun Plaza such as traditional performances, musicals and hands-on programs. The National Hangeul Museum will hold a special exhibition on Hangeul during the modern era. There will be lectures, magic shows and music performances. Visitors can also experience how the wooden block printing system worked. 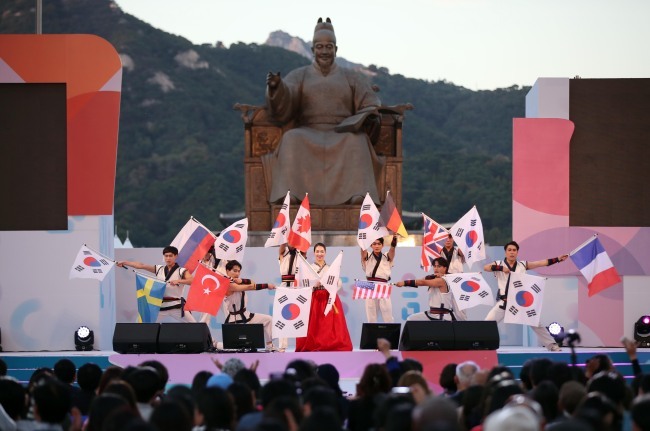 Chonnam National University, located in Gwangju, will host a Korean speaking contest, including a Jeolla Province dialect contest and a speaking contest for foreigners. The story of how Sejong created the writing system can be witnessed through the musical “1446.” The piece, which marks the year Hangeul was promulgated, focuses on the king’s struggles. The musical will run at Theater Yong at the National Museum of Korea in Yongsan-gu, Seoul, through Dec. 2.